Medium bob haircuts are still one of the most popular easy-care styles, because they flatter almost all face shapes. And not only that, medium bobs are a versatile style you can wear sleek, casual, curly, wavy or windswept – depending on your mood. So if you’re looking for a simple style that’s both trendy and easy to maintain, take a moment to see the latest looks here! This classic medium bob is a very clever piece of hairstyling, guaranteed to balance a less than perfect face shape! Cut to chin-length, a universally flattering length, the hair has an off-center parting. Casually draped sections of hair frame the face, softening the line. And they also cover the outer edges of a wide forehead. This balances the ‘wide’ top of the face to a narrow chin, which has hair at chin-length to add width. The light-brown hair gains texture and movement from fine blonde balayage in harmonizing pale beige. Suits heart-shaped and long, narrow faces. Here’s a young and trendy hairstyle suitable for adding volume to fine hair. To achieve this fashionably light, neutral blonde shade all over the head, you need to have naturally fair hair to begin with. Otherwise the bleaching process can cause too much damage to your hair. On fine hair, lightening adds ‘body’ by causing individual hair shafts to thicken, and lose their natural silky texture. 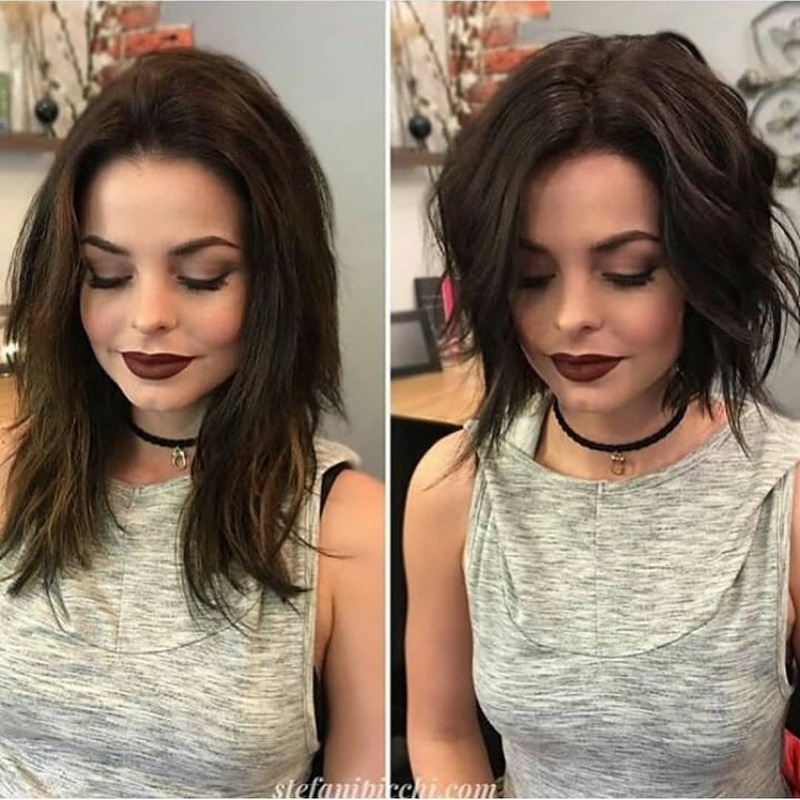 The hair has long layers, with shorter lengths creating added interest at the back of the angled bob with a casual, tousled finish. 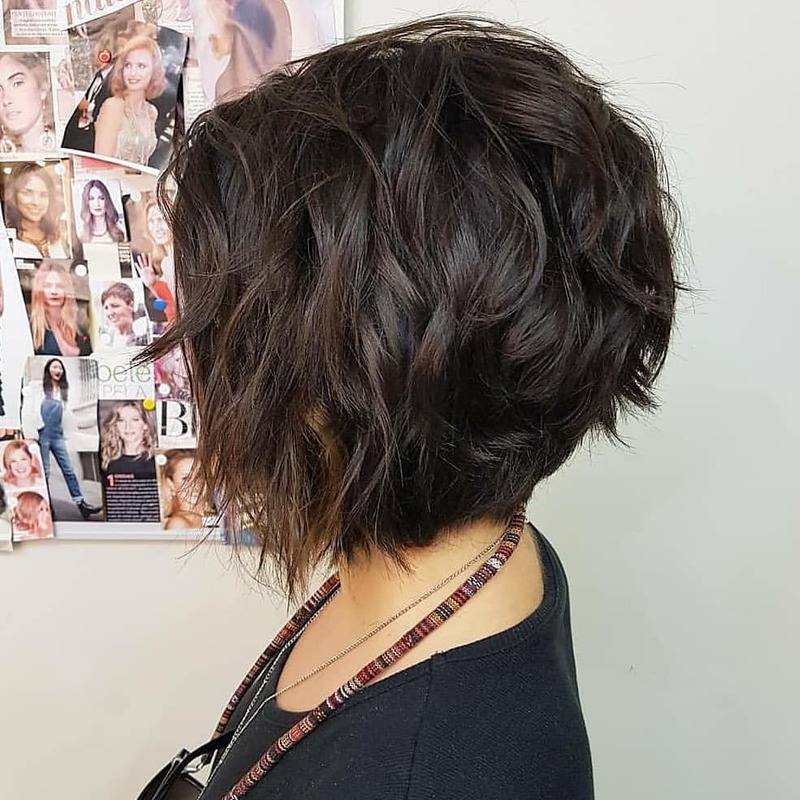 Thick hair looks fabulous in this angled bob, as the density allows the tips to be strongly tapered for an edgy, shaggy finish. Thick hair should be cut in vertical, sliced layers to remove the tendency to bulk at the tips. With an off-center parting, it’s easy to create face-framing wings to accentuate the eyes and lips. And flicked-out tips add width around the chin and a lovely flirty finish! Here’s a cute, shorter bob haircut ending at jaw-length, to draw attention to the lips. The long, straight-across bangs are new and trendy this season. And separating the bangs adds ‘length’ to the face and softens the line. The sides have a tousled, wavy texture fluffed out to create volume and width to the face shape. The tips are lightly textured and flipped-out in a style that adds width to the model’s narrow chin. This is a great style for narrow, long and heart-shaped faces! The stacked back angled bob is always in fashion and has retained its ‘modern’ look almost 50 years now! It’s a great choice for thick, strong hair types that have effortless volume in the curved focal point above the nape. This version is styled to suit the current fashion for a vertical parting showing off one ear on the shorter side. And the surface is decorated with defined strands with a slight bend to break the straight lines. From a side parting, this asymmetrical bob creates an alluring front view with the swept-over section draping sexily over one eye! Wow! This new color has tons of visual impact and really brings out the blue tones in the model’s eyes. This is a simple, straight style that has long layers graduated near the tips to produce a natural curved line. The top gains face-flattering height from hair casually styled up from the forehead. And this is a good way to add length to a wide or round face. Shorter layers at eye-level draw attention to those pretty blue eyes and cheekbones. This simple, easy-care look is also packed with texture, movement and fabulously eye-catching color! 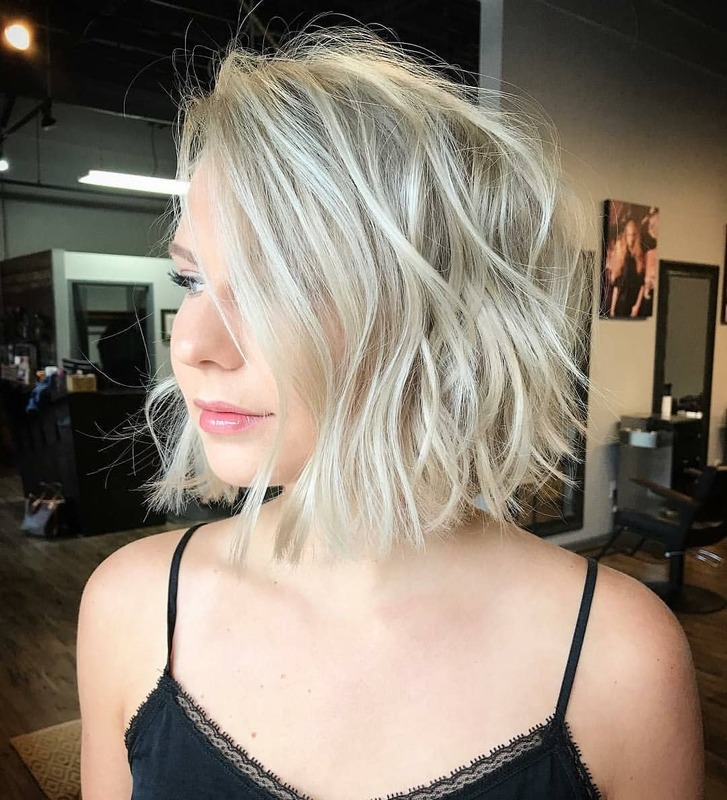 This neck-hugging version of the popular medium angled bob is a softer look than the stacked-back bob. It’s a great look for medium textured hair and the profile shows a feminine, soft curve decorating the back. The hair is layered, with longer, straight layers on either side of the chin, which are graduated upwards to create a soft, face-frame. Lovely ‘flat’ waves arranged on the surface of this bouffant look add fabulous texture and movement to a cute, natural, brunette haircut. Cut at the same length around the head, this gorgeous bob suits fine and medium hair types. The absence of layers retains all the density of fine hair, which is waved to create attractive volume on top and at the sides. The relaxed way of styling from a blurred side parting adds height to a low forehead and allows hair to cascade down in a flirty, peek-a-boo section. The tips are lightly textured to avoid thinning out the ends. And this light and dark contrast creates stunning 3-D color depth, making hair appear thicker! 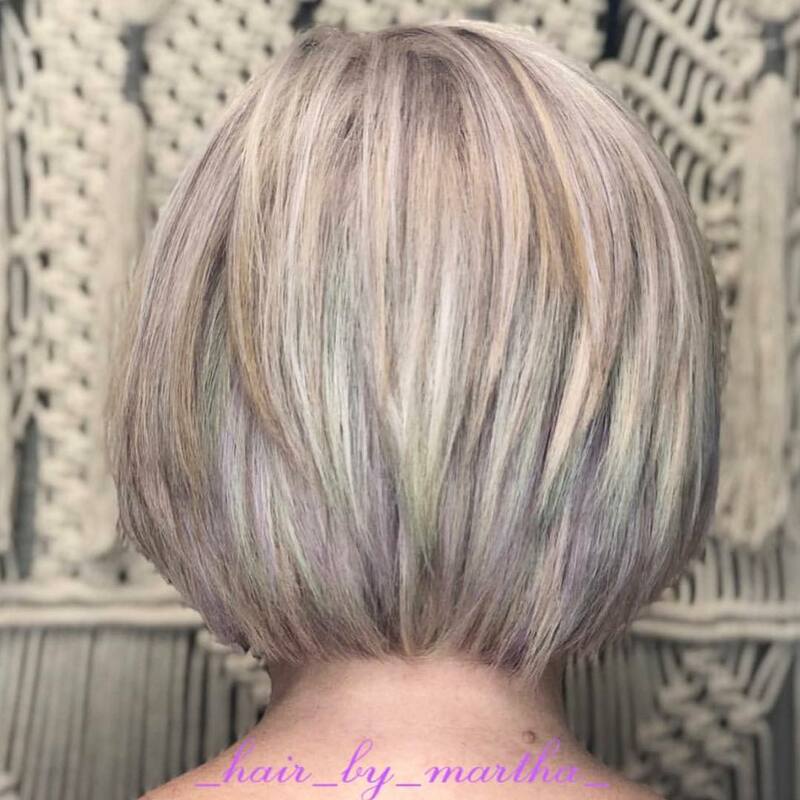 This straight, layered medium bob haircut is simplicity itself to maintain, and a popular choice for over-50 women’s hairstyles. Sliced-layers create a lovely shape to thick hair, for curves that hug the neck and are easy to style after washing. Chin-length bobs keep the focus up on the face, avoiding the dragging down effect of long hair on a mature face. Yellow tips are often left behind on graying hair and should be cut off if possible. Just adding a toner in pink, purple, blue or apricot can add fashion style to natural gray hair. 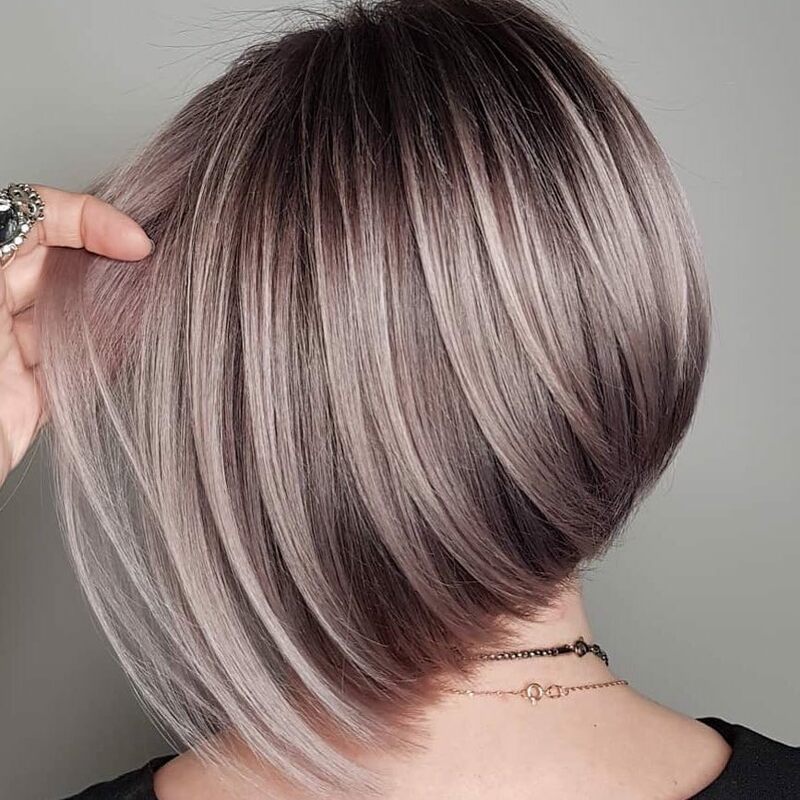 This super-smooth classic angled bob is a joy to behold and shows off beautifully healthy, shiny hair. 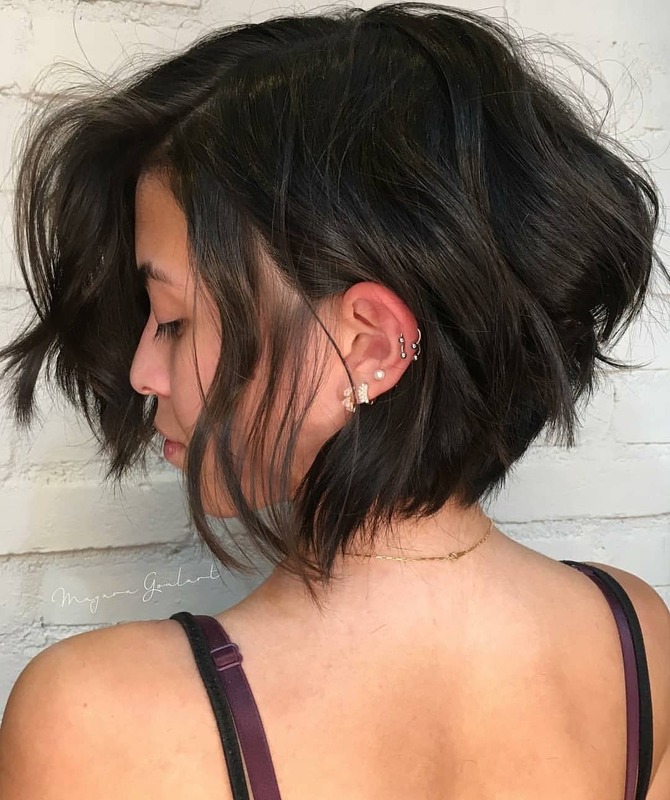 It’s suitable for fine and medium hair types and the simplicity of the curved lines makes the perfect background for a lovely, modern coloring technique. 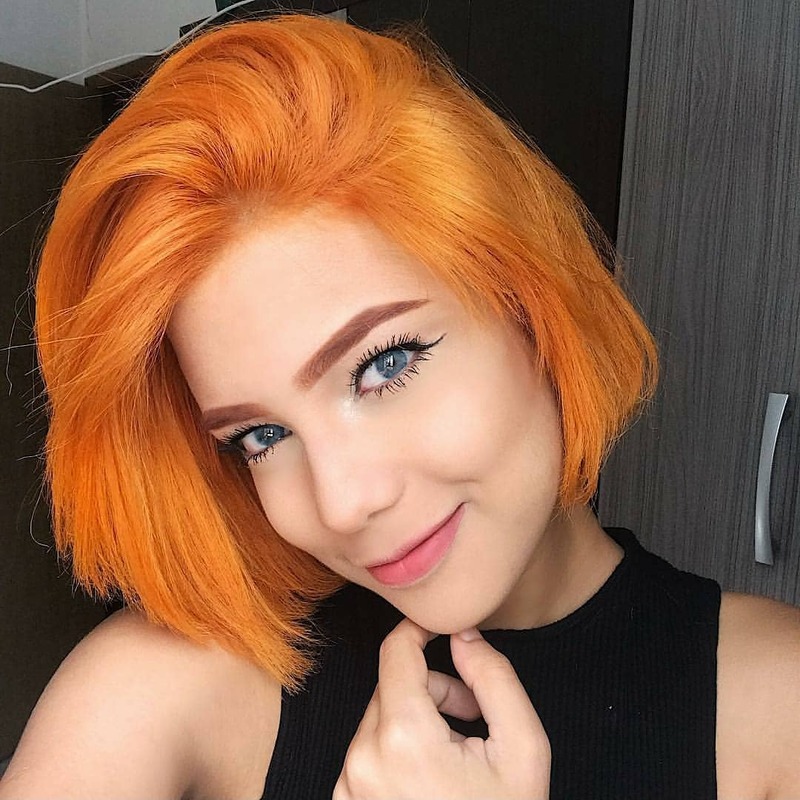 The darker roots and tips are highlighted by a horizontal band of ash-blonde around the head that mimics the effect of a light shining on the hair! And the ash shade is softened by touches of beige and pink toner, to create a very chic, new look!